1. This cooking direction describes Chicken Pepper Soup. 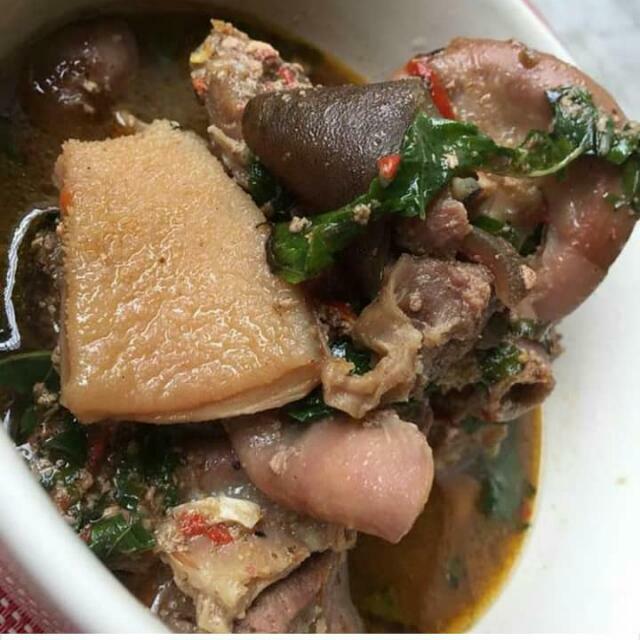 To prepare Goat Meat Pepper Soup, Cow Foot Pepper Soup or Assorted Beef Pepper Soup just substitute chicken with cow foot or beef and offal respectively. 2. Place the pieces of chicken in a pot and pour enough water to cover the contents of the pot. Add the stock cubes, thyme and onions and cook till done. Note: When cooking Assorted Beef Pepper Soup, you should cook the shaki for sometime before adding the other beef parts. Shaki is tough and will take longer to cook than the other beef parts. Cow foot is a tough part of meat so when cooking Cow Foot Pepper Soup, you should use a pressure cooker if you have one. This will save you some gas or electricity. 3. By now, you will notice that some of the water has dried. Add more water to bring it to the level of the contents of the pot. 4. Add the ground Ehu, dry uziza, chilli pepper and salt to taste. Ehu has some spicy taste so you should add chilli pepper with care. Even though it is called pepper soup, you still want to be able to taste and enjoy the recipe itself. Too much chilli pepper will ruin it for you. 5. Cover the pot and leave to boil for 5 minutes and the pepper soup is ready. Pepper Soup should always be served hot. It can be eaten alone with a chilled drink by the side. You can also eat it with Agidi , White Rice or Boiled Yam .